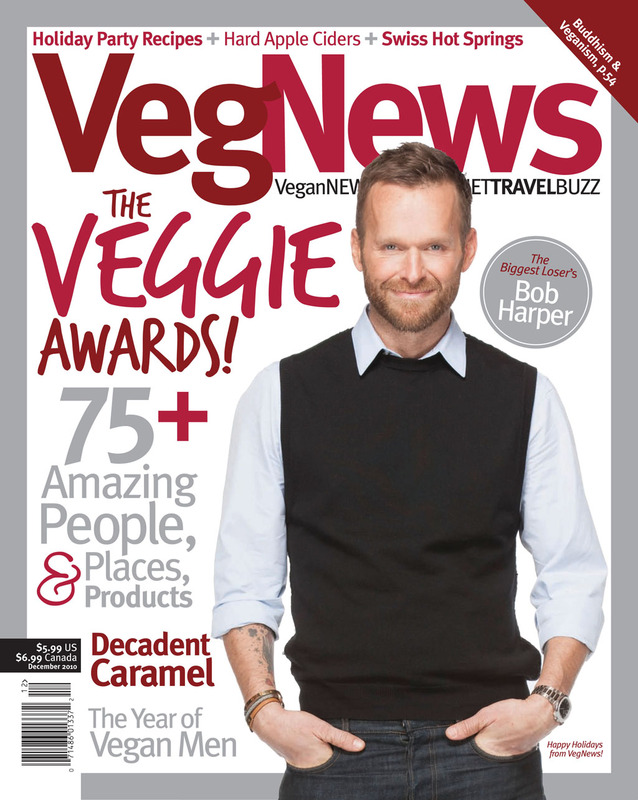 Here’s the article VegNews Magazine so kindly asked my to write for them in their Nov/Dec 2010 issue. 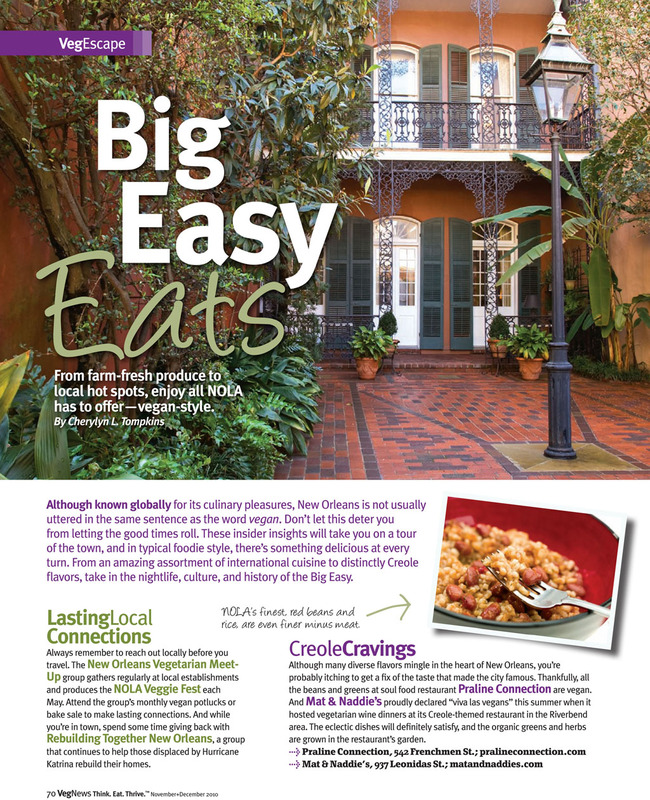 It’s called ‘Big Easy Eats’ for their travel column entitled, VegEscape. They were so beautiful to work with. It was a great joy and honor that they (Hi to Elizabeth Castoria, VN Managing Editor, and Sutton Long, VN Art Director!!) thought of and asked me because this was one of my goals since transitioning to a Vegan Lifestyle 5 1/2 years ago!! 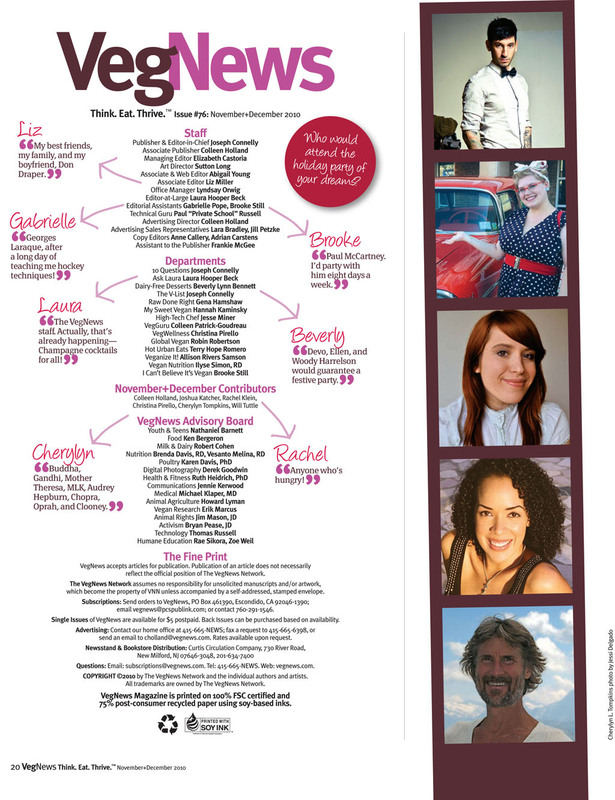 They were even so fabulous to include me on their Contributor’s Page … YAY!!! 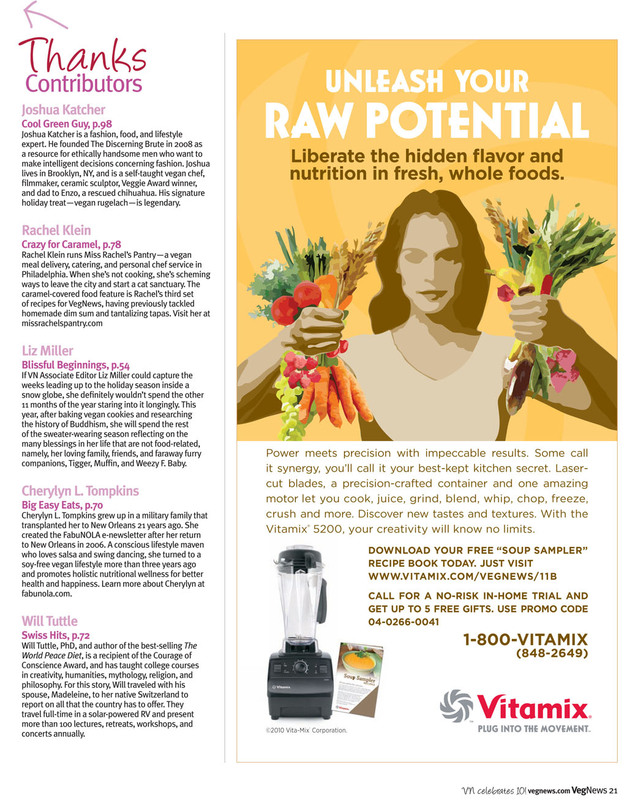 You’ll notice an ad for Vita-Mix that manifested itself within the “Contributor’s Bio” page. Well, I just happen to be an Affiliate for Vita-Mix Blenders & Accessories. You get special extras when ordering through an Affiliate (plus you can take advantage of split payments). I will soon be getting the direct phone # for the Vita-Mix rep who handles my sales, as well as a direct web link that will send you straight to their site and still track sales for me. To order through me, please use my special Vita-Mix personal ID Code for referral … which is 06-004530 (please do NOT use the one in the article below). You can call 800-VITAMIX for now. You can also email me at Fabu@FabuNOLA.com, if you have any issues or questions. If you didn’t get to pick up your own copy back then, here’s a post of the pages I was featured on plus my article (and a link to them all below). I hope you thoroughly enjoy! Always remember, it’s very possible to be a Fabulous Vegan Being, no matter where you are …. yes, even in FabuNOLA!! And the possibilities keep growing. Since the time I first posted this, New Orleans has grown in many great ways on the Vegan & Raw Vegan front. So, I wanted to give current update (as of 7/13/2012 … and some new updates as of 4/1/2014) of where you can now go for Vegan treats in FabuNOLA!! And … I have so many of you contacting me, now more than ever before it seems, to find out where to go to eat Veg in town and how to transition to Vegan/Raw Vegan. It’s coming for all groups … those of you in town who are either Veg and wanting to connect to more places OR really interested in transitioning for various reasons. PLUS, all of my peeps from out-of-town who are coming and want to know all the spots to go (either because you are Veg or just became Veg … LOVE —–> IT!!). First, I’ll start with those already listed in article below … that need an update. I wish I didn’t have to say it … however, Lazziza’s in the Marigny is no longer. It’s become another restaurant. Wish it wasn’t so because I loved the owner and it was also a great Salsa dance spot on Fridays (which has also now changed). Mojito’s on corner of Frenchmen & Esplanade has taken over for the weekend Salsa music & dancing scene … and they also happen to offer so great Veg options on their menu (some just make slight adjustment to make completely Vegan). As for expansion, I can happily say that Surrey’s and La Divina Gelateria have added locations so please go on their sites to find the multiple locations. That’s fabulous news for them!! Keep growing!! For the new places that have cropped up since I was away assisting my Family with health issues … I’m very excited by the bountiful new crop of Vegan abundance. If a location hasn’t been added yet, it may soon be (or reply) OR it depends on what type of Vegan food they are serving. If it’s heavy on Soy and not so healthy choices (NO … Soy isn’t health for you … it’s just been marketed to you as if it is) … I really don’t want to steer you in that direction either. A couple of favorites are The Green Fork and Superfoods Bar because they both have actual and proper Raw Vegan choices that I’m in LOVE with. The Green Fork has cooked/baked Vegan too … and they are mostly Gluten & Soy-Free (and remember … I don’t eat or support Soy so I won’t list a place that has too much of it listed on their menu without having healthier and non-soy options). I just got word that Superfoods Bar acquired the space next door so their smaller “pop in and order to-go” location will expand to a Vegan & Raw Vegan Cafe. The Green Fork just added stools and area along the wall when you first walk-in for people to now be able to pick-up and “sit down” to enjoy their yummy goodness. The Green Fork also offers delivery service on certain days. You can get on their weekly email list that will send out the new specials for the week every Sunday. Menu changes regularly depending on what’s local and organic (and if it runs out and they can’t find it organic … it’s out). You just don’t know how excited I am that they are both flourishing now after being open for a short amount of time (2 years for The Green Fork as a catering business and initially selling to downtown offices … 1 year for Superfoods Bar). I’m also excited that The Green Fork is located about 5 blocks from me. Update: Both locations have been thriving for years now and have expanded. Superfoods Bar opened up a wall into the space next door to expand an art gallery along with seating and expanded menu. The Green Fork now has a 2nd location located on Metairie Road. Their hours on Friday and Saturday have expanded too. Yay!! Restaurants like Sante Fe (only the Saint Charles location … where the former La Madeleine used to be) and Carmo are specifically reaching out to the New Orleans Veg Community by offering fabulous Vegan items on their menus. Sante Fe Tapas (on St. Charles Ave) is offering a Saturday Vegan Brunch every week from 11 am-3 pm (update: they now have a Vegan menu you can ask for during the week too). I finally got to go to Carmo to eat dinner (because I had previously tasted their beautiful food during NOLA Veggie Fests). It was for my special Birthday dinner on July 19, 2012 … which also happened to coincide with them being one of the restaurants participating in “Dining Out For Life” benefiting NO/AIDS Task Force. I can’t begin to tell you how over joyed I was by the whole lovely experience. AND … everything we ate and shared was Vegan (my non-Vegan friends were WOW by how phenomenal it all was/is). I want to THANK Christina & Dana Honn (Carmo owners) plus Drew (our fantastic co-owner & new lovely friend) for everything. And special THANKS to my dear friends, Jessi & Lidya for sharing in the joy with me. We’ve already decided to make Carmo a regular gathering spot for us. Fabulous!!! Update: Carmo has expanded their weekend hours (Yay!! ), menu and space … with more expansions to come when they open their upstairs space … hopefully soon. I did get to Lilly’s Authentic Vietnamese Cafe on Magazine in Lower Garden District (next to The Cat Practice) that just opened a few months ago. They have Vegan Pho (I asked for more Veggies instead of Tofo) and it was great. Lilly’s pretty fabulous and very sweet too. Fatoush Mediterranean Grill Juice Bar is located in the New Orleans Healing Ctr and has lots of Veg options along with Fabulous owner!! NOLA Food Co-Op is also in same building with great options. Other offerings include Mardi Gras Zone in the Marigny. Yep … it’s a 24 Hour market serving some healthier choices now … including Veg yummies. Superfoods Bar let me know that they will now be also serving Smoothies & Juices on certain days/times at Mardi Gras Zone starting in July (update: not sure if they are still doing this … I think maybe not anymore). AND now the N.O. Food Co-Op is fully up and running in the New Orleans Healing Center. Please do go & consider becoming a member (not required to purchase at location but you can receive discounts when you do plus member appreciation days monthly). Below I’ve listed Crescent City Farmer’s Market and others. 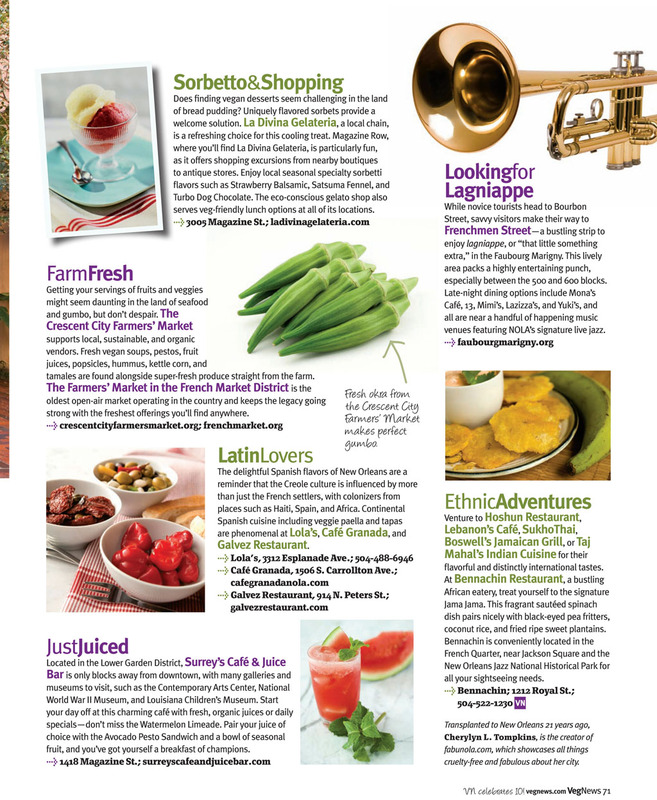 However, I really want to mention Hollygrove Market and Edible City Garden. Hollygrove sells their local produce boxes for $25 during the week (except on Fridays). You can also opt for off-site pick-up or home delivery (must sign-up in advance). The box items a local throughout parts of the Gulf Coast Region and change regularly. Update: Hollygrove is now open every day with expanded hours. Besides the box, you can also pick up many other items outside of getting the box (or that don’t come in the box). Edible City Garden is run by Michele Claiborne (originally from New Orleans … although her accent comes from moving to Australia at a young age … she has returned to her roots) who is a Raw Food Chef, Herbalist, Natural Healer & Counselor. They have a free school open to the public almost every Wednesday from 4-6 pm. She welcomes all of you coming out to learn more. I will add links soon as well as more choices as they come (and/or I can check out personally). Until then … Google any that aren’t listed with the location in my original article below. I’m really ecstatic about the new choices exploding into Vegan Fabulous Abundance!! I’ve been letting people know about ALL of the new Vegan, Raw Vegan and Veg-Friendly places that have popped up around town. There are so many that I haven’t had enough time to update here. I’ve done so on Facebook or individually so I wanted to turn my attention back to my FabuNOLA Blog so I can better serve the masses here. Here’s a quick listing of places so far. I’ll have to add great stories of all the fabulous places later. For now, I just want to get it posted because so many people keep asking!! So, Google if you need exact locations, websites, contact info, etc. AND, in anticipation of their Grand Opening tomorrow, I’m moving Seed to the top of this list (which actually isn’t in any particular order because I hope you support all or as many as you can), especially because they are going to BE amazing!!! Please support this and all the restaurants you can that are offering flavorful, plant-based foods for your Fabulous Delight!! Bhava just opened recently above Feelings Cafe (although more soy than I would like, they still have things that aren’t and I know Ann Churchill the owner … she’s pretty fabulous and will accommodate). City Greens (http://eatcitygreens.com), Fresh Bar (http://freshbarnola.com) & Green Goddess (http://www.greengoddessrestaurant.com) … I haven’t been to these locations yet to check out (although I am thoroughly impressed by City Greens growing their own greens and also just started offering fresh pressed juices … and I do drive by Fresh Bar quite often on the way to the Farmer’s Market Uptown). Others mention these location so I will here too. I just haven’t been able to go and thus research accordingly (which I usually like to do before I post anything). So, there may BE some places I left off so I’ll think of them when I can (although I’m pretty sure I’ve covered the majority of the new ones so this should BE good for now). Looking forward to these places thriving and to even more new and fabulous Veggie endeavors on the horizon!! BE sure to read my VegNew Mag article below and refer to these updates for all the new places/changes in our Fabulous City!!! Eat Healthy, Happy and & Fabulously!! !